3 wheel 49cc trike for sale. Don't want to hassle with a motorcycle license or 2 wheel scooter? In most states 50cc and under you will need NO LICENSE AT ALL! What if you only work a few blocks from home, here is the one of the newest and most cost effective ways to get there! If you have been shopping around, you have seen the gimmicks they use to get you to their websites. Well, now you can buy one under $1800 delivered to your door! 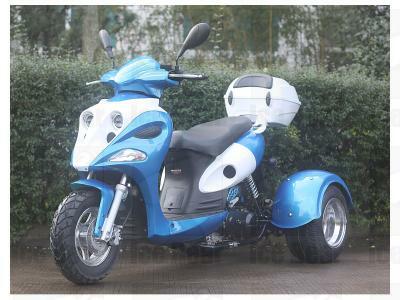 It is the perfect choice for those that prefer the security of a three wheel 50cc scooter as opposed to the traditional two-wheel scooter. This trike will cross the generational divide from the *teenager to the senior citizen for transportation needs whether it be for school, work or play. Get yours today while inventory last!! Please note, you may be asked to pre-order at certain times of the year. A pre-order is two weeks at a time. If pre-order is offered and you wish to purchase, we advise you pre-order to guarantee the unit because of the demand, these are selling out before they are even here! Call us at 877-300-8707 with any questions! 49CC Ace Trike Scooter - REAR DIFFERENTIAL EQUIPPED! Assembly Fee $150 Assembled by our Certified Mechanic. Please Call 877-300-8707first. Not just in stock but viewable online! We know there is so much more to just buying a wholesale motorcycle, gas motor scooter or moped. As a veteran dealer with over eight years of online shipping experience, we have built our company on a stable foundation. Carrying parts and the ability to easily find what you need is more important that just the initial sale! With that statement, we naturally are willing to back up our comments with a fully functional, automated and user-friendly department just for you the customer! So, when it's time for your first service and if you ever need anything from a spark plug to a tire. We have you covered. With over 60,000 parts in stock at the click of a mouse you are rest assured when you need it, we have it!